Multivariate Data Analysis refers to any statistical technique used to analyze data. This essentially models reality for each situation, product, or decision. Our multivariate capabilities give our clients the ability to obtain a clear picture of what is going on and make intelligent decisions. Below are examples of the most common functions. 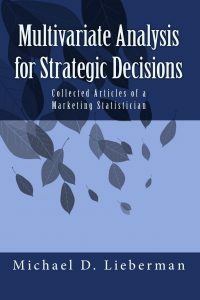 A collection based on statistical methods and inference to solve strategic marketing issues, define choice motives, forecast the optimum price of items, and discuss thought within the marketing, research, and strategic consulting industries. Available on Amazon. Canonical Analysis is used to asses the relationship between two sets of variables. TURF Analysis is an acronym for “Total Unduplicated Reach and Frequency”, is a type of statistical analysis used for providing estimates of media or market potential and devising optimal ways how to use it given the limited resources. Fair Share Analysis measures the magnitude of brand or product attributes. Derived vs. Stated Importance Analysis: A derived quadrant that shows the different between what customers say is important, and what they actions show is important. Factor Analysis, a data reduction technique, groups arrays of attributes into families. Quadrant Analysis is particularly useful to marketers when trying to determine how product categories, segments and individual SKUs are performing. Regression Analysis is used for prediction for the affect of individual attributes on a depend variable, such as ‘Purchase Intent’ or ‘Overall Satisfaction’. Discriminant Analysis is used in situations where you want to build a predictive model of group membership based on demographic or other data. Maximum Difference Analysis show a set of the possible items and are asked to indicate the most and least appealing, in essence asking the consumer to choose elements of consumer products. Structural Equation Modeling (SEM) is a statistical technique for testing and estimating relationships using a combination of statistical data and qualitative causal assumptions. Among its strengths is the ability to model constructs as latent variables. Zone of Tolerance Analysis asks respondents their “Desired Service Level” and “Adequate Service Level” for each attribute. A range—between what is ideal and adequate—is calculated for each attribute. It is commonly used in pharmaceutical research. A Step Further – Measuring Improvement of NPS explains how to discover which factors improve the Net Promoter Score metric which reflects consumers’ recommendations of a product or brand.